Last Tuesday, the 20 whoopers migrating from Wisconsin to Florida with help from ultralight aircraft were in Fentress County, Tenn.
Today, the U.S. Fish & Wildlife Service said they've arrived in Gordon County, Ga. The birds and their human pilot have covered about 130 miles, if my Rand McNally map-reading abilities aren't completely off. Click on the map to see a larger version of it. For detailed updates about the project, visit Operation Migration's Field Journal. UPDATE: A hot-off-the-presses news release from USFWS said the flock is down to 19 cranes. The youngest of the flock, number 26, was found dead Nov. 10 at an Indiana stopover. 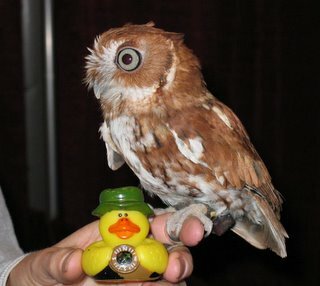 "It had one visible injury, around the left eye," the release stated. "A brief field examination by a veterinarian shed little light on the bird's death, and it was sent to the U.S. Geological Survey's National Wildlife Health Center in Madison, Wis., for a necropsy." If you're working on conservation projects on private land that benefit endangered or threatened species, that is. Before Jan. 23, the U.S. 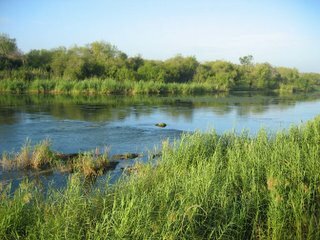 Fish & Wildlife Service wants to receive proposals for funding through its Private Stewardship Grants Program. Approximately $6.5 million is ripe for the pickin's. Click on the above link for more details, or write to U.S. 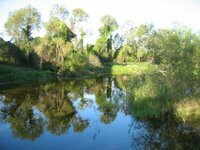 Fish & Wildlife Service Branch of State Grants/Endangered Species Program, 4401 N. Fairfax Drive Room 420, Arlington VA 22203. What're you waitin' for? Go get some moolah for the birds! Vote for Birder of the Year today! Have you mailed your ballot for the Birder of the Year contest? The postmark deadline is Dec. 1 -- this Thursday. What's the Birder of the Year contest, you ask? It begins in the January/February issue each year. Readers can respond to the questions posed in two departments, The Lister's Forum and Birder's Back Yard. Some responses appear in later issues, and one response in each department earns a Bushnell 8x42 NatureView binocular, a certificate from WildBird and a nomination for Birder of the Year. In the November/December issue, readers see summaries about the 12 candidates and the ballot. (It appears on page 39 of the Nov/Dec 2005 issue.) They also read details about the prizes. This year, the loot includes a Bushnell Elite 8x43 binocular, an Elite spotting scope, round-trip airfare for two to south Texas, and a rental car, courtesy of Bushnell Performance Optics. The winner also will receive two-night accommodations at Alamo Inn in Alamo and at Vieh's Bed & Breakfast in San Benito, guided outings to local birding sites, and [sarcasm]my delightful company[/sarcasm]. Previous winners visited New York City; Sanibel Island, Fla.; and Cape May, N.J. You can read about the 2004 Birder of the Year's rarity-filled trip to south Texas in the May/June 2005 issue. The 2005 Birder of the Year will be revealed in the March/April 2006 issue. Participate in the fun by mailing your ballot (no photocopies!) today and by answering the questions posed in The Lister's Forum and Birder's Back Yard! Did you hear that the Convention on Migratory Species listed Red Knot as endangered during its conference in Nairobi, Kenya, last week? Red Knot is one of 11 species added to the list of more than 105 migratory animals. CMS operates within the United Nations Environment Program. It listed Red Knot within Appendix I, meaning that "Measures that should be undertaken by relevant governments include improving habitats and breeding sites and removing obstacles to their migration." Does this provide any "oomph" to U.S. efforts to conserve the species' migratory staging areas, particularly the Delaware Bay? I hear them before seeing them--five little birds squawking like the dickens while flying at first light. The timing is just as hoped... about 6:30 a.m. (my watch is broken so I can't confirm the exact minute). The five birds surprise me, though, coming from an unexpected direction. Then I hear squawks from the anticipated location and turn my head to see two larger birds emerge from the taller palm tree on the northeast corner of Costa Mesa Street and Orange Avenue. That's where I'd thought to see and hear all seven birds emerge. Are they Yellow-chevroned Parakeets or White-winged Parakeets? I don't know. The soft light doesn't allow for a look at their wings, and the morning schedule doesn't allow me to follow their route. I'm just pleased to see seven of the fast-flapping squawkers, and I hope to trace their morning flight on another day soon. Does seeing incredible birds like Roseate Spoonbill and Crested Caracara diminish my delight in watching my regular backyard birds? Heavens, no. The Bushtits are just as amusing, the hummingbirds just as ornery and the Black Phoebes just as dapper as they were before I attended the festivals in Texas and Florida. Observing the (to my eyes) flamboyant specialty birds of the Rio Grande Valley and the Space Coast provided great fun but in no way reduces the charm and wonder of the birds that stop by my back yard. I do not tire of watching the dapper black-and-white flycatcher perch on the telephone wires, the apricot tree or the top of the patio umbrella before it swoops over the lawn and snaps its bill on a bug. If that ever happens, then, well, we've got a problem, Houston. Have you seen National Geographic's online game inspired by "March of the Penguins"? You can play it here. The first two levels were pretty easy to complete, but the third level introduced some challenges (a rock and an icehole) as well as fish. I earned bonus points for capturing the fish. In the next levels, more father penguins started shuffling in front of me, a crevass or two decorated the ice, rocks got in the way, chicks started wobbling around the area, and a skua flew overhead repeatedly. Luckily, those obstacles didn't deter me from continually moving, keeping the egg on my feet and making the Egg'o'Meter climb to the red portion so that the egg could hatch. Lemme warn you: Level 13 was a turning point. My score was 5810 at Level 20, when my mate arrived. Any takers? For lots of details about Emperor Penguins (the stars of "March") and other penguin species, check out Ornithology 101 in the January/February 2006 issue. Having just seen my first whoopers last week, I enjoyed receiving a press release from the U.S. 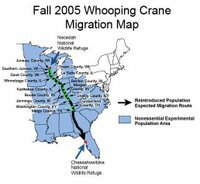 Fish and Wildlife Service about the 20 cranes now migrating from Wisconsin to Florida. Here's the skinny. The birds entered Fentress County in Tennessee today while following five ultralight aircraft from Operation Migration. 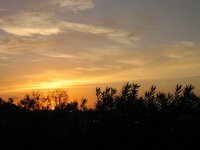 They left Necedah National Wildlife Refuge near Necedah, Wis., on Oct. 14 and began the 1,228-mile migration to Chassahowitzka NWR in Crystal River, Fla. This is the fifth generation of the endangered species to fly to their winter home with human assistance. The chicks hatched at Patuxent Wildlife Research Center in Laurel, Md., and grew up away from humans but with ultralights. Operation Migration pilots as well as Patuxent and International Crane Foundation biologists conditioned the birds to fly for longer distances behind the aircraft. Everyone who works with the chicks wears crane costumes and uses puppet heads to mimic adult bird behaviors. 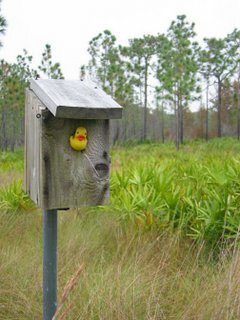 During the migration, the birds stay in temporary pens at stopover sites on private property volunteered by landowners. More than 35 landowners are participating in the current migration. Pretty cool what we humans will do for the benefit of birds, eh? The 42 migratory birds in the East make up a small part of the 300 or so whoopers in the wild. Another migratory population nests at Wood Buffalo National Park in Canada's Northwest Territories and spends the winter at Aransas NWR near Austwell, Texas. 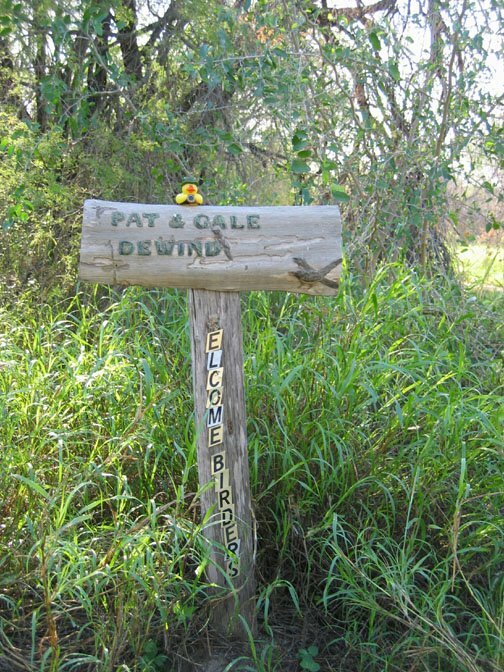 A nonmigratory flock lives in central Florida. For daily updates by members of the migration team, visit the OM field journal. 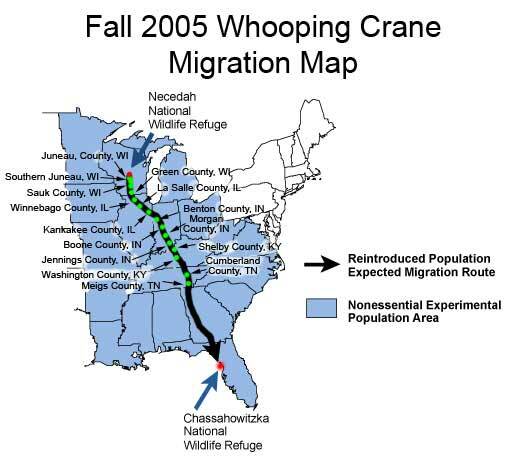 You'll find more details at Whooping Crane Eastern Partnership. If projects like this warm your heart, please warm the project's coffers by donating funds. The afternoon brought a festive meal at the Ace of Hearts Ranch, featuring live music by Patchwork and a wildlife display by Safari Todd Wildlife Productions. The latter included scorpions, tarantulas and snakes, among other creatures. After loading my plate with BBQ pork, beans, biscuit and a seven-layer chocolate bar, I enjoyed a seat with familiar faces at one of the red-and-white-checked tables underneath the picnic shelter decorated with white Christmas-tree lights. 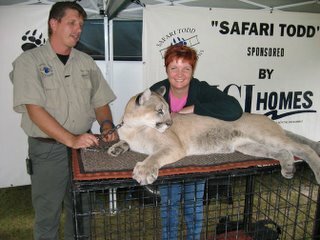 When Safari Todd brought out one of his two endangered Florida panthers, I had to revisit the display. Then he and his assistants let visitors pet the big kitty and listen to her purr. I couldn't resist the opportunity. What an awesome animal! The social provided a wonderful way to end two weeks of festival attendance. I look forward to attending next year's event... and maybe even handling the scorpions, tarantulas and snakes among Safari Todd's menagerie. For the final day of field trips, I joined the Canaveral Marshes/Blue Heron Created Wetlands excursion. 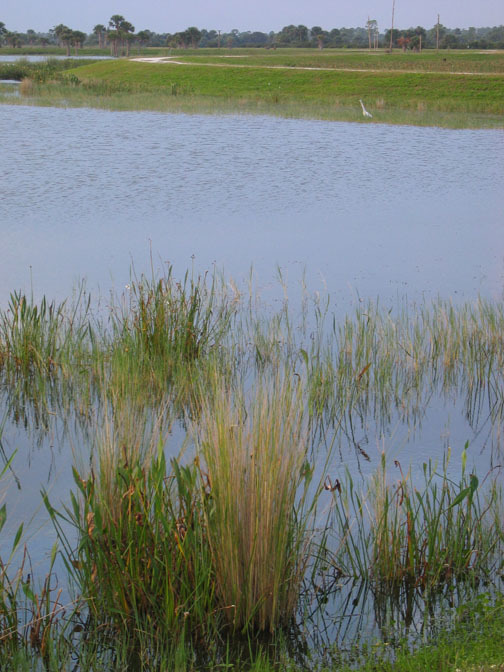 We drove through The Great Outdoors, an incredibly upscale RV resort, to reach the marshes. During our walk toward the hammock, we saw or heard Carolina Wren, Northern Cardinal, Gray Catbird, Pine Warbler, Eastern Phoebe, Sora, Red-shouldered Hawk, Great Egret, Green Heron, Red-bellied Woodpecker (foraging less than 10 feet above my head! ), Yellow-bellied Sapsucker, Downy Woodpecker and Wild Turkey. 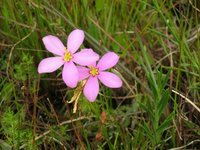 During the fun, muddy hike to the Indian shell midden, I did my best to avoid cobwebs and cow patties while admiring wild orchids. Then someone spied this incredibly red mushroom. The miniscule plant's color reminded me of a Vermilion Flycatcher in the sunlight. 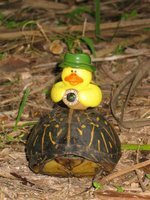 We encountered three Florida box turtles during the hammock hike, two females and a male. The females have flat undersides, while the males have indented undersides to aid breeding efforts. This is one of the females, maybe 5 inches long and 3 inches tall. 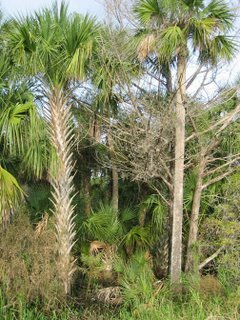 On the walk from the hammock toward the bus, we spied Great Blue Heron, Anhinga, Snowy Egret, Tricolored Heron and Blue-gray Gnatcatcher. Then we drove to Blue Heron Water Reclamation Plant for a leisurely drive around the cells and ponds. I enjoyed seeing Double-crested Cormorant, Anhinga, American Coot, Common Moorhen, Bald Eagle, Great Blue Heron, Great Egret, Little Blue Heron, Glossy Ibis, Red-winged Blackbird, Pied-billed Grebe, Northern Harrier, Ruddy Duck, Wood Stork and Tricolored Heron. One of the things I like about festivals is the chance to see birds very upclose. 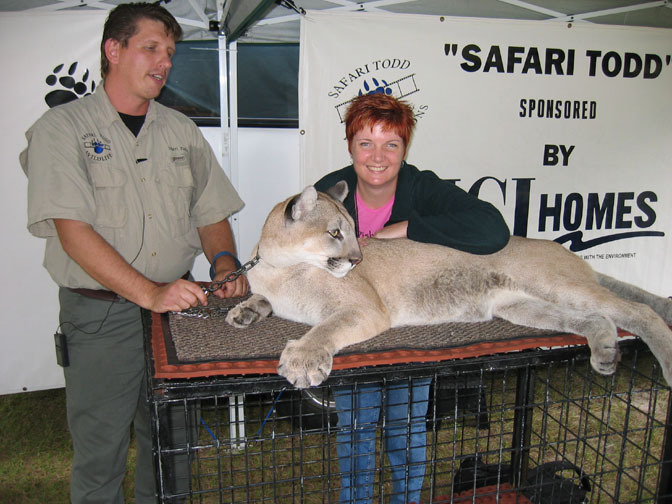 Rehabilitation centers and educational programs occasionally appear amid the vendor exhibits at festivals and give us a chance to really peer at these fantastic creatures. Three exhibitors in the Brevard Community College gymnatorium provided those opportunities during Space Coast. At the Audubon Center for Birds of Prey booth, I came almost nose-to-beak with an American Kestrel and a Crested Caracara. On the opposite side of the hall in the Florida Wildlife Hospital booth, an Eastern Screech-Owl named Gonzo posed for me. Look how little he is! Up on the stage, Jonathan Wood's The Raptor Project provided quite the sight with more than 10 owls, eagles, falcons and hawks displayed for our perusal. Isn't Uncle Sam magnificent? We set off for Viera Wetlands via exit 191 off 95 south. We looked for Crested Caracara at Temple Israel near the roundabout but didn't see any of the raptors. After signing in at the wetlands, however, we did see or hear Crested Caracara as well as White Ibis, Glossy Ibis, Anhinga, Little Blue Heron, Sandhill Crane, Roseate Spoonbill(!) in flight, Tricolored Heron (which I spied hidden in the pond--go me! ), Northern Harrier, Green Heron, Belted Kingfisher, Northern Shoveler, Pied-billed Grebe, American Coot, Great Egret, Killdeer, Loggerhead Shrike, Greater Yellowlegs, Common Moorhen, Blue-winged Teal, Canvasback, Mourning Dove, Palm Warbler, Mottled Duck and Red-shouldered Hawk displaying the white crescent mentioned in Jeff Bouton's raptor workshop the previous day. 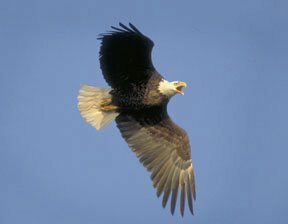 We watched at least three Bald Eagles in the first half hour at the wetlands. 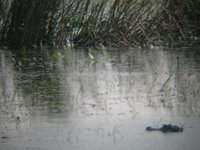 One mottled-looking juvenile perched atop the three poles in the upper right of the large picture above, returning to the poles after hunting American Coots. We didn't see it capture a meal but enjoyed observing its dives. We got to watch a Great Blue Heron kill and eat most of a snake before spying an American Kestrel on the neighboring sod farm. After driving to a mobile home park, we watched beautiful Black-bellied Whistling-Ducks eating cracked corn in a resident's front yard. That scene concluded our field trip and prompted me to find lunch ASAP. Inspired by a friend, Sharon, I took a picture of Roseate Spoonbills through a 10x42 binocular so that the bin served as a zoom lens. The result obviously is not a great image of the scene at Scottsmoor Landing but more impressive than the 3x zoom on the digital camera. Is there an official term for using a binocular as a zoom lens for a digital camera? If I remember correctly, Andy Farnsworth at Cornell referred to it as "digibining," and he's used the technique in the past. It makes sense for the term to mimic "digiscoping" (the use of a digital camera with a spotting scope). The technique is growing in popularity and had a consistent presence during the Space Coast festival. 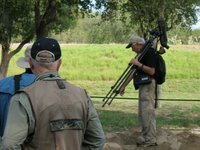 Each day included a digiscoping seminar, and Thursday's keynote address by Neil Fifer focused on it. The North Brevard hotspots field trip began with an extended stop on Hatbill Road off SR 46. The bus drove for a while down Hatbill and stopped only because water flooded the road. 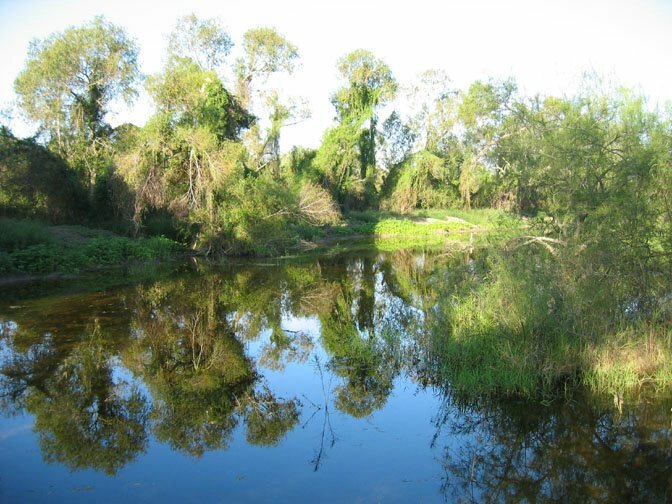 Rainwater has saturated the St. John’s River floodplain. While standing at that intersection leading to Baxter Point, we saw and heard Eastern Phoebe (it sounds similar to the Black Phoebes in my back yard but doesn't look as dapper), Great Egret, Yellow-bellied Sapsucker, American Bittern(! ), Little Blue Heron, Pileated Woodpecker, American Robin, Common Yellowthroat, White Ibis, Red-bellied Woodpecker, Turkey Vulture and Red-shouldered Hawk. Retreating toward SR 46, we saw Ruby-crowned Kinglet, Northern Cardinal and Northern Mockingbird among others. We also watched three otters walk across the dirt road—a treat! 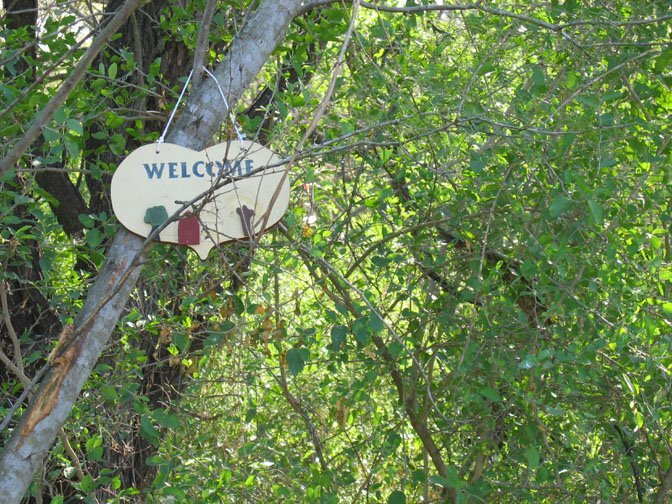 Next, we invaded leader Doug Stuckey’s home to observe visitors to the feeders and vegetation. I especially enjoyed the male and female Painted Buntings on two seed feeders in the back yard and a Ruby-throated Hummingbird guarding a tree in the front yard. Its little head swiveled left, right, left, right continuously before it flew to chase another hummer. At the F.I.N.D. dredge site, we got to see American White Pelican, American Avocet (very good-looking birds in their black-and-white winter plumage), Hooded Merganser, White Ibis, Great Egret, Double-crested Cormorant, Pied-billed Grebe and Northern Harrier. On the way to the next hotspot, we spied American Kestrel and Loggerhead Shrike on the telephone wires. 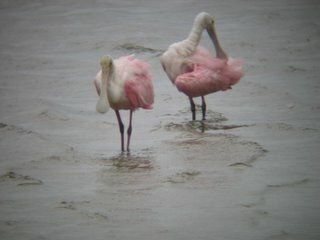 Scottsmoor Landing provided fantastic views of Roseate Spoonbill, Reddish Egret, Little Blue Heron, Tricolored Heron, Wood Stork, White Ibis, Snowy Egret, Double-crested Cormorant, Brown Pelican, Royal Tern and Forster’s Tern. I especially enjoyed watching the seven red-eyed spoonbills feeding in the shallow water and swinging their bills left, right, left, right. What a great sighting to finish the day! Continued bus trouble prompted another stop that yielded a lot of great birds. I enjoyed seeing Loggerhead Shrike, Sandhill Crane, Belted Kingfisher, Crested Caracara, White Ibis, Wood Stork, Great Blue Heron, Anhinga, Black Vulture and American Kestrel. Two cranes were eating in the nearby field, and four more flew in and scared off the original pair. The four called repeatedly, and one bird stood sentry while the other three began eating. It was my first time seeing Sandhills do anything other than stand in a field or ditch, so I really enjoyed the show. We finally made it to Three Lakes, where I saw Bald Eagle, Turkey Vulture, Red-bellied Woodpecker, American Robin, Downy Woodpecker, Brown-headed Nuthatch, Eastern Bluebird and Ruby-crowned Kinglet. We had lots of time to explore the area while waiting for a replacement bus. 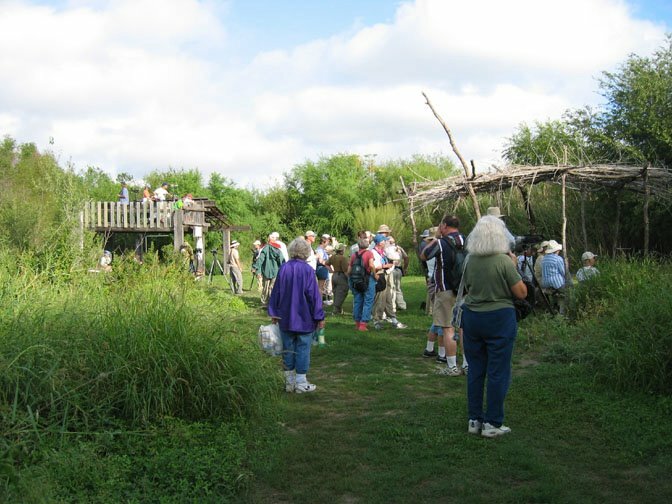 At Joe Overstreet Landing, the group saw and heard many species, including White Ibis, Glossy Ibis, Whooping Crane(! ), Great Egret, Snail Kite(! ), Loggerhead Shrike (such a dapper-looking little predator), Palm Warbler, Greater Yellowlegs, Sandhill Crane, Red-winged Blackbird, Pied-billed Grebe, Cattle Egret and Wilson's Snipe. The four Whoopers were eating in a grassy area for a while and let us approach rather closely. Each had radio transmitters and colored bands on their legs. At one point, they flew with three Sandhills to another spot in the grass, allowing a good view of the species' size differences. 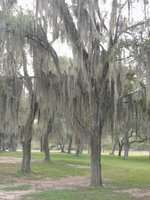 We saw Double-crested Cormorant, Wood Stork and Black Vulture at Lake Marian before eating lunch at Forever Florida Wilderness Preserve's Cypress Restaurant. The hot chocolate felt wonderful after the chilly morning, and the meal--BBQ sandwich, coleslaw, beans and peach/cherry cobbler--hit the spot. Forever Florida's logo is a Swallow-tailed Kite, which I saw for the first time about six years ago during a Birder of the Year trip to Corkscrew Swamp Sanctuary near Naples. In fact, the Birder of the Year was Ken Behrens, who participated last April on the Swift WildBirders team in the Great Texas Birding Classic. 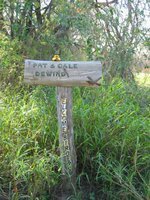 You can find details about Forever Florida, Three Lakes and Joe Overstreet Landing in the east section guide of the Great Florida Birding Trail. 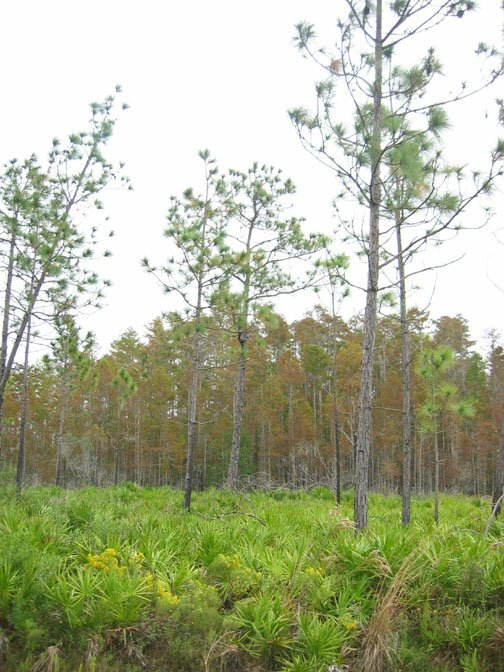 Three Lakes contains longleaf pine forest, favored by the endangered black-and-white woodpecker with a white cheek patch. 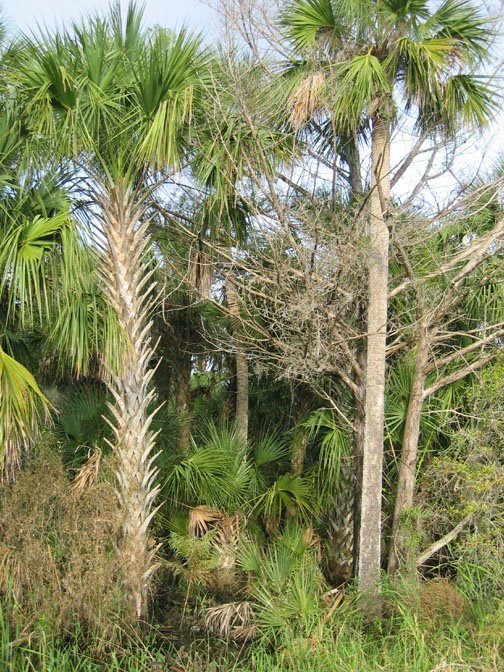 The area also features palmettos everywhere. The three of us birded for a while with another trio from the festival, and none of us spied a Red-cockaded Woodpecker. One fellow did come away especially happy after seeing one of his target species, Brown-headed Nuthatch. Some of the roadside wildflowers looked so colorful and beautiful... almost too dainty to be a plant living unprotected in the open. I'll have to look for their names later. By the end of the day, I saw Crested Caracara, Downy Woodpecker, Prairie Warbler, Eastern Bluebird, juvenile White Ibis, Red-bellied Woodpecker, Bald Eagle, Red-shouldered Hawk, Red-winged Blackbird, Northern Mockingbird, Eastern Meadowlark and Sandhill Crane. I was stoked to see the cranes. The ninth annual event officially will begin tomorrow. One of the scheduled field trips, the pelagic, unfortunately has been cancelled because of small craft warnings about high seas. Darn. I was really looking forward to spending the day out on the water on Miss Cape Canaveral. 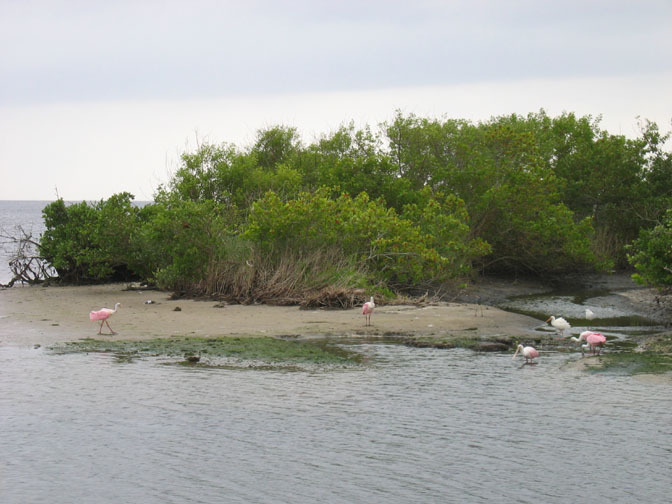 The excursion would've included views of the launch pads at Kennedy Space Center before and after visiting The Steeples, an area of underwater cliffs and seamounts. In leiu of that field trip, I'll try to mooch a ride with cohorts who want to search for Red-cockaded Woodpecker and Brown-headed Nuthatch at Three Lakes Wildlife Management Area. Both would be new to me. This year's program includes a mind-boggling number of options: field trips, workshops, seminars, photography demonstrations, paddling trips, keynotes and an exhibitor hall with equipment and photography for sale. Oh--the exhibitor hall features a booth with a massage therapist; why don't more festivals include that service? What an excellent idea! I signed up for a field trip each day between Nov. 16-20, including Wednesday's pelagic, which has a history of being cancelled. I'm crossing my fingers that it goes out this year! The field trip to Brownsville on Sunday featured three stops: Resaca Boulevard, Sabal Palm Audubon Center and Sanctuary and Boca Chica. Our leaders included John Odgers, Kevin Karlson, Jay Packer and Richard Gibbons. Kevin is a WildBird Advisory Board member and writes the Birder's I.D. column in each issue, so I enjoyed the chance to bird with him. At Resaca Boulevard, we split into small groups, and I went with Jay and a handful of other folks. We saw Double-crested Cormorants perched in trees, Green Parakeets, Cooper's Hawk, Pied-billed Grebe, Carolina Wren, Anhinga, Great Kiskadee (one sat on a telephone, repeatedly calling while holding a dragonfly in his bill), Black-bellied Whistling-Duck, Great Egret, Snowy Egret, Golden-fronted Woodpecker, Common Moorhen (with its candy-corn beak), Greater White-fronted Geese flying in a checkmark formation, Vermilion Flycatcher and Couch's Kingbird. 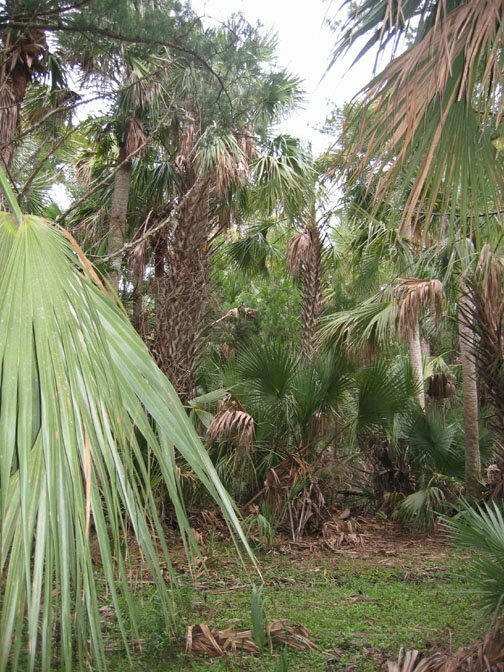 Moving on to Sabal Palm--known for Plain Chachalaca, Green Jay, Olive Sparrow and White-tipped Dove--we again split into groups, and I joined Richard's cadre. 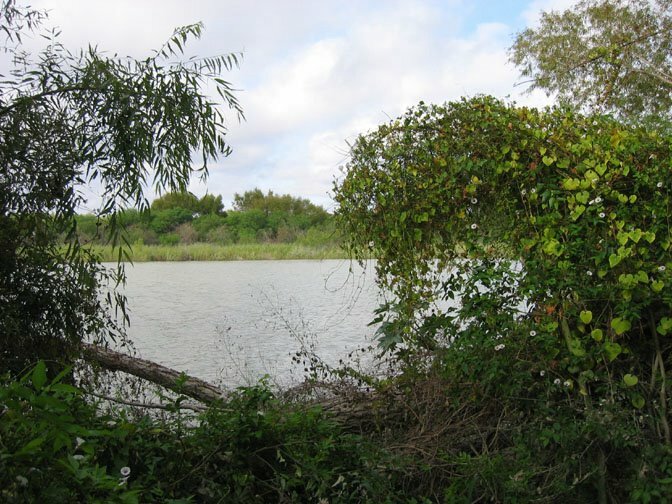 We took the resaca loop trail and immediately saw Plain Chachalacas and Green Jays--as well as mosquitoes. Pull out that bug spray to thwart them and chiggers! We also saw or heard Least Grebe, Eastern Phoebe, Olive Sparrow, Couch's Kingbird, Turkey Vulture and Red-shouldered Hawk. At the photo blind, I enjoyed seeing Ringed Kingfisher and American Coot, pulling up and eating aquatic plants. My favorite bird at Sabal Palm undoubtedly is Groove-billed Ani. 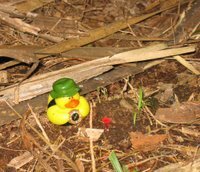 The prehistoric-looking bird initially thwarted us by hiding in the brush (likely because of a hawk flying overhead) but responded to the judicious use of a recording. I saw four anis perched in the open at one point, and they really made my day. The next stop, Boca Chica, offered a great lineup of terns and shorebirds. Kevin expounded on his method of birding by impression with Forster's Tern, Royal Tern, Caspian Tern and Sandwich Tern along the wet sand. We also saw Sanderling, Ruddy Turnstone and Ring-billed Gull. Along the drive back to the auditorium, we saw Long-billed Curlew, Willet, White-tailed Hawk and Scissor-tailed Flycatcher. It was a fantastically birdy day and a great way to end the festival! Tim Gallagher’s presentation on Saturday night covered a lot of material from his book about the history and rediscovery of the Ivory-billed Woodpecker. 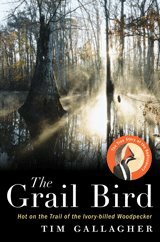 Folks who’ve read The Grail Bird heard and saw familiar information about the Lord God Bird and Tim’s quest of many years. Tim shared new information during his presentation, such as a map of all the ivory-bill sightings reported since 1944. The map showed many sightings throughout the bird’s former range in the United States, and it prompted the fellow next to me to practically fly out of his chair out of desire to read all the details on it. When Tim showed a slide of Bobby Harrison, his long-time partner in the ivory-bill quest, and Andrew Farnsworth, I had to smile. It’s fun to see Andy, who participated in WildBird’s Great Texas Birding Classic team many years ago, involved in adventures like this and earning recognition for his skills. Then Tim treated the birders in the auditorium to sounds and sights that many likely hadn’t heard or seen. He played a digital version of an audio recording from the Singer Tract in 1935. It sounded incredible to hear the bird’s kent or tin-horn calls fill the huge room. Tim also played kent calls recorded in the White River National Wildlife Refuge in January 2005 and a double-knock (BAM-bam) recording from January 2005. A map of the recent calls and knocks puts them in the same two locations: the sighting by Mary Scott in 2003 and the sighting by Tim and Bobby in February 2004. We got to see a version of David Luneau’s video that looks much better than the one available online. The audience audibly responded to the sight of a dark bird with lots of white plumage quickly flying away from Luneau’s canoe. Afterward, Tim signed copies of The Grail Bird. I very much enjoyed the chance to meet the associate editor of WildBird when the magazine debuted in 1987 and one of the rediscoverers of the Ivory-billed Woodpecker in 2004. 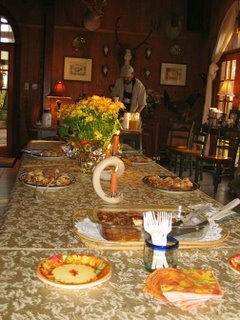 Saturday's field trip to El Canelo Ranch with leaders Michael O'Brien, Louise Zemaitis, Chris Merkord and Marissa Ahlering started with a flourish when owner Monica Burdette greeted us with fresh homemade baked goodies, coffee and orange juice. What a treat! For years, The Inn at El Canelo has been known for the resident Ferruginous Pygmy-Owls. Monica unfortunately had to tell us that the lone female--a Cooper's Hawk took her mate last spring--wasn't seen the previous day, which raised the possibility that we wouldn't see her either. While walking around the property, we did see many other species, such as White-tailed Hawk, Crested Caracara, Harris' Hawk, Killdeer, American Kestrel, Eastern Phoebe, Pyrrhuloxia, Western Meadowlark, Inca Dove, Golden-fronted Woodpecker, Curve-billed Thrasher, Savannah Sparrow, Grasshopper Sparrow, a flock of Lark Buntings, Lark Sparrow, Sharp-shinned Hawk, Turkey Vulture and Black Vulture--but no owl. 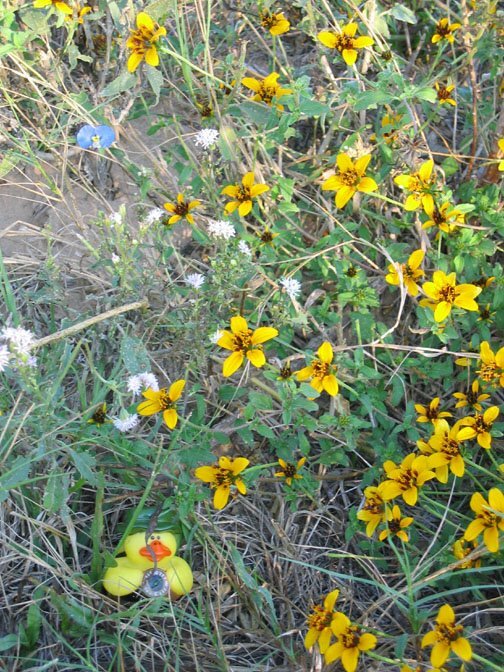 I liked looking at the wildflowers, too, including a dark blue one that Louise identified as an Asiatic dayflower. It has three purple curled stamens and look darn pretty in person; too bad it's non-native. By the way, if you encounter a coral snake, look but don't touch. 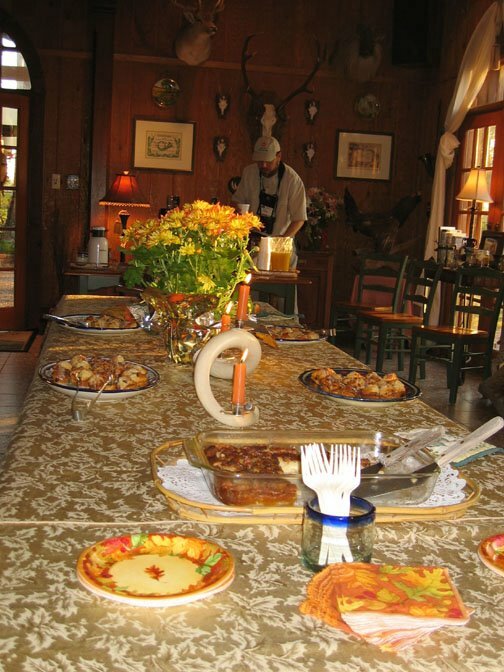 When we got back to the inn, we found that Monica had left copies of the recipe of the most popular baked good--a pull-apart goodie topped with pecans that she called Quick Caramel Coffee Ring. To my mind, that outweighs all the chigger bites on my legs, ankles and feet (again, slather on the insect repellent, and even consider tucking the pant legs into the socks). 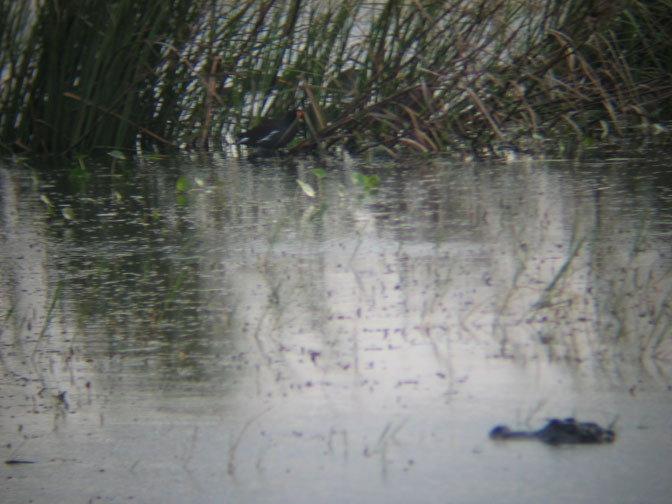 On the way out to the main road, the bus stopped near a pond that had Black-necked Stilts and Least Sandpipers. We walked through a nearby area in hopes of flushing a Sprague's Pipit--and it worked. At least three pipits flew in front of and above us before we boarded the bus. On the road toward the highway, a Scissor-tailed Flycatcher perched on a wire fence. It sat within 15 feet from the bus and seemed nonplussed by the huge vehicle slowly rolling past it and stopping so that we could admire its long tail and red shoulder patches. It even flew up briefly and perched again, which gave us a delightful view. On Friday afternoon, eBird Project Leader Brian Sullivan talked in the municipal auditorium about the new version of the online program by Cornell Lab of Ornithology. 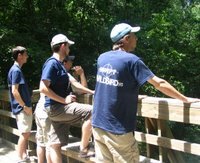 He and Project Leader Chris Wood have revamped the program with the tagline "Birding with a purpose." The interactive website gathers observations by birders into a central database so that birders and scientists in Canada, the United States and Mexico can use it. It allows us to "monitor birds at a scale that's never before been attempted," Sullivan said. The second version makes it easier to enter data and to generate information that birders can use. Sullivan said, "We want data from everyone." 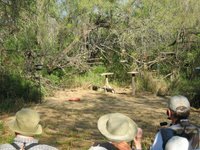 That includes students just beginning to learn about birds to experts who've focused on avian behavior for more than 20 years. The new eBird generates lists--such as life, state and county--within the My eBird section of the site. It also allows users to generate maps and frequency bar charts about a specific species as well as frequency bar charts for a location. When an eBird user enters data into the program, Sullivan said, "You're feeding data into Avian Knowledge Network." 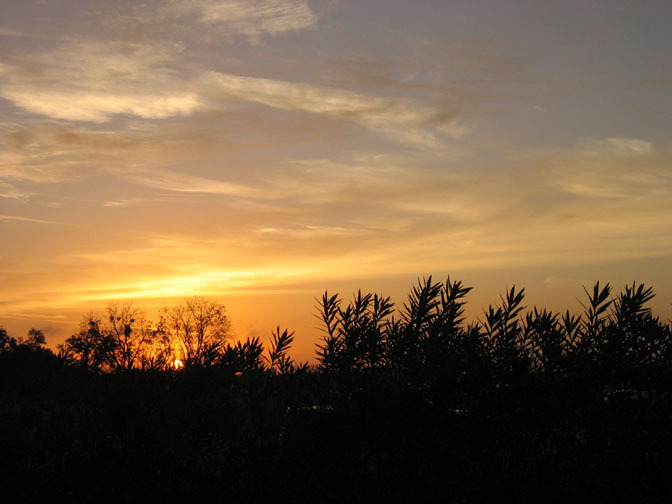 The network includes Cornell and Point Reyes Bird Observatory, among other collaborators. "The idea is to break down boundaries," whether they're national/political or institutional, Sullivan said. "It's time to pull together data and look at the big picture." Why don't you peek at eBird now and see what it looks like? Anzalduas County Park beckoned to us as the bus left the municipal auditorium Friday at 6 a.m. At the front of the bus were leaders Victor Emanuel, Barry Lyon, Mark Scheuerman and Ben Lizdas. Before reaching the park, we made an unscheduled stop to look for a Burrowing Owl in fields on the other side of a levee. The owl obliged by appearing on a concrete culvert and showing us its fantastic yellow eyes. Other birds obliged by popping up on the nearby telephone poles and wires, flying above the fields or perching on posts. We observed Northern Harriers, Eastern Phoebe, Couch's Kingbird, Golden-fronted Woodpecker, American Kestrel, Great Kiskadee and Loggerhead Shrike. For an unscheduled stop, the location offered a wonderful number of species. It was awesome! Then we drove to Anzalduas County Park and saw lots of birds and bugs. Within 20 minutes of leaving the bus, we saw Green Jays, Golden-fronted Woodpeckers, Black-throated Green Warbler (beautiful!) and a Ladder-backed Woodpecker while it fed. Then we stalked a Northern Beardless-Tyrannulet for about 15 minutes and finally got good looks at the elusive flycatcher, considered rare in Texas. After following the road over a levee, we walked beside a leafcutter ant colony that really impressed Victor. He said the "wonderful" colony is the largest that he's seen in the United States. Victor described the human equivalent of an ant carrying a leaf is a person carrying an 18-wheeler truck while running a three-minute mile. Zow! Some folks in the group were butterfliers, so the various fluttering insects along the road caught their attention. One particular butterfly caught everyone's attention with its intensely colored upperwings: a Mexican bluewing. Continuing down the road and beside the river, we saw a juvenile Vermilion Flycatcher, Northern Harrier, Double-crested and Neotropic Cormorants, Spotted Sandpiper, Least Sandpiper and White-tailed Kite. We stalked Sprague's Pipit in a large field but didn't get good looks at the handful that flew up from the grass. Rather than returning to their spots, they flew away. Barry found a Savannah Sparrow in the grass, sitting maybe 20 feet in front of the group. Through the spotting scope, the "little brown job" looked great. I also enjoyed a long look at an Osprey overhead. Such magnificent birds. What a fantastic day! The only downslide: the mosquitoes. They were somethin' fierce and bit me through my shirt sleeves. Next time that I visit Anzalduas, I'll slather on the insect repellent before boarding the bus! Thursday's Upper Rio Grande field trip began at 5 a.m. with the bus pointed northwest to Chapeno and El Rio RV Park. The park along the Rio Grande is known for the Brown Jays that visit its platform feeders. We saw Brown Jays soon after arriving at the park. One jay flew to a fruit feeder and took away half an orange! 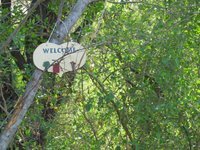 The trip leaders--Derek Muschalek, Mark Scheuerman, Ben Lizdas and Willie Sekula--pointed out many species coming to the feeders and in the riverside area. I enjoyed seeing Ringed Kingfisher, Altamira Oriole, Green Jay, Audubon's Oriole, Osprey, Green Kingfisher, Spotted Sandpiper and Northern Shoveler. The generous folks at the RV park not only feed the birds, they feed birders! Our group enjoyed the iced, homemade donuts and coffee before walking down the road in search of more birds, such as Harris' Hawks. The bus retrieved us and then set off for Salineno, the site of the DeWinds' incredible feeder area. The generous Michigan residents spend the winter in Salineno and set up multiple seed, fruit and sugar-water feeders as well as folding chairs for the visiting birders. The DeWinds certainly know how to make birds and birders feel welcome to their amphitheatre of avian activity. While the group filled the chairs and nearby area, various species came to the feeders: Green Jays (oh the Green Jays! ), Black-crested Titmouse, Chipping Sparrow, Golden-fronted Woodpecker and Orange-crowned Warbler among others. 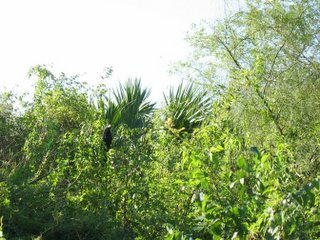 After most of the group left to investigate the river, two much-anticipated species appeared at the same time: Altamira Oriole and Hooded Oriole. The few of us to see the simultaneous visitors had a great chance to compare and contrast the species' field marks. Wednesday morning began very early, with the alarm penetrating my brain at 4:33 a.m. After a mad dash to Harlingen's municipal auditorium, I boarded the bus for the Zapata and San Ygnacio field trip. The trip's five leaders included Jim Danzenbaker, Michael Retter, Richard Gibbons, Justin Rink and Jay Packer. 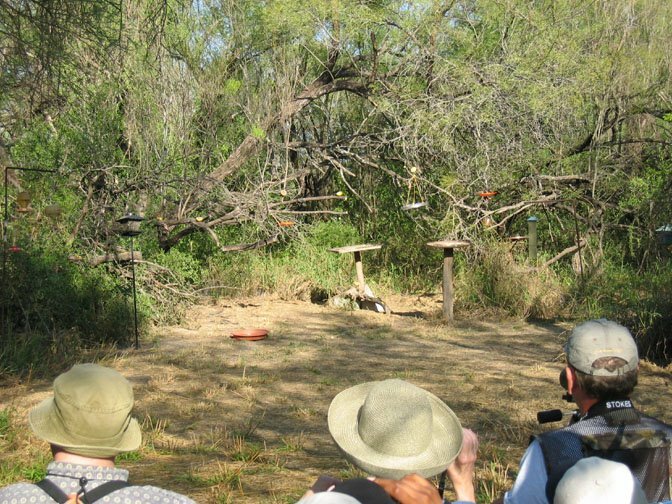 We visited the San Ygnacio Bird and Butterfly Sanctuary, known for its White-collared Seedeaters. The group didn't see that species, but I enjoyed seeing the Clay-colored Robin, Olive Sparrow, Ringed Kingfishers calling overhead, Belted Kingfisher perched on the Mexico side of the Rio Grande, Great Kiskadee, Black-crowned Night-Herons flying above the water, brilliantly colored Altamira Orioles, and Osprey. Later in the day, I marveled at the soaring Harris' Hawk, Crested Caracara and Red-tailed Hawk; Green Jay; and Golden-fronted Woodpecker. At the Zapata County library, Richard pointed out a Scissor-tailed Flycatcher on the telephone wire. What a cool bird. We ate lunch at Falcon County Park--known for Black-throated Sparrows--before beginning the drive south on 83. The bus returned to the auditorium about 4:30 p.m. The day felt incredibly long but provided a great start to the festival for this birder! One of the neat things about birding is that you never know when it'll become a connecting point between strangers. On the plane from Orange County to Houston, I pulled out a birding magazine, and the fellow across the aisle noticed the cover. He asked if I'm a birder and generously pointed out that the Outdoor section in Tuesday's Los Angeles Time included an article by Simon Barnes, author of How to Be a Bad Birdwatcher (one of my favorite lunchtime books). In the Times' article, titled "A very natural reaction: Lost in the evolutionary debate is Darwin's most basic lesson: the value of observing nature," Barnes wrote about the similarities between Charles Darwin and Edward O. Wilson, among other things. He used a line from Darwin's On the Origin of Species (1859) as a thread throughout the long article: "Endless forms most beautiful." No doubt anyone who appreciates nature can appreciate the simple appeal and all-encompassing power of that phrase. That's what I'll be thinking of while in south Texas this week--the endless variety of bird species that pass before my eyes. Tomorrow marks the beginning of another travel adventure: a two-week trip to attend two festivals. Tuesday's flights will put me in Harlingen, Texas, for the Rio Grande Valley Birding Festival. WildBird has participated as a sponsor in previous years, but this is my first opportunity to attend the well-regarded event. Well regarded by whom? Optics reps, field trip leaders and speakers, that's who. Those folks attend many events during one calendar year, and they know what makes a good festival. They like RGV, so I want to experience it for myself. It won't be my first time to visit the lower Rio Grande Valley, however. The Great Texas Birding Classic has taken me to the area, as did the 2004 Birder of the Year trip with Jody Hildreth and his lovely wife, Kelly. During the latter trip, I fell in love with Green Jays--what beautiful birds! You can read Jody's account of that trip, chockfull of Mexican strays, on page 6 in the May/June 2005 issue of WildBird. 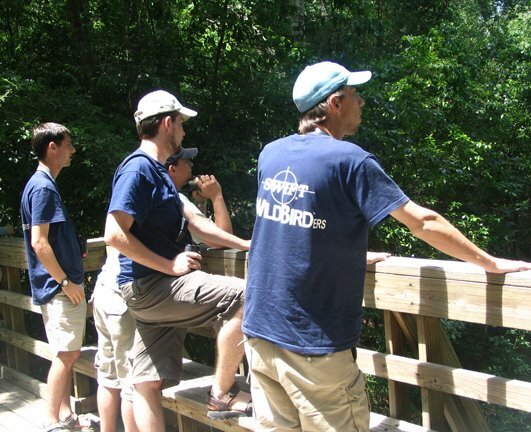 Those fellows above are the Swift WildBirders, our team in the 2005 Classic: Pete Hosner, Matt Hafner, Michael Retter and Ken Behrens. By the way, the deadline to vote for the 2005 Birder of the Year is DEC. 1. Please participate by sending in your ballot, which appears on page 39 in the November/December 2005 issue (no photocopies, please!). 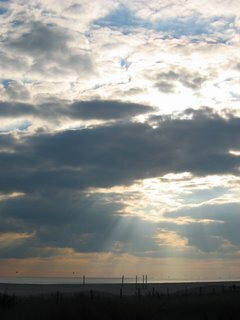 This image--taken during Autumn Weekend from Cape May's boardwalk--perfectly shows my outlook after finishing an issue of WildBird. The clouds are thinning! 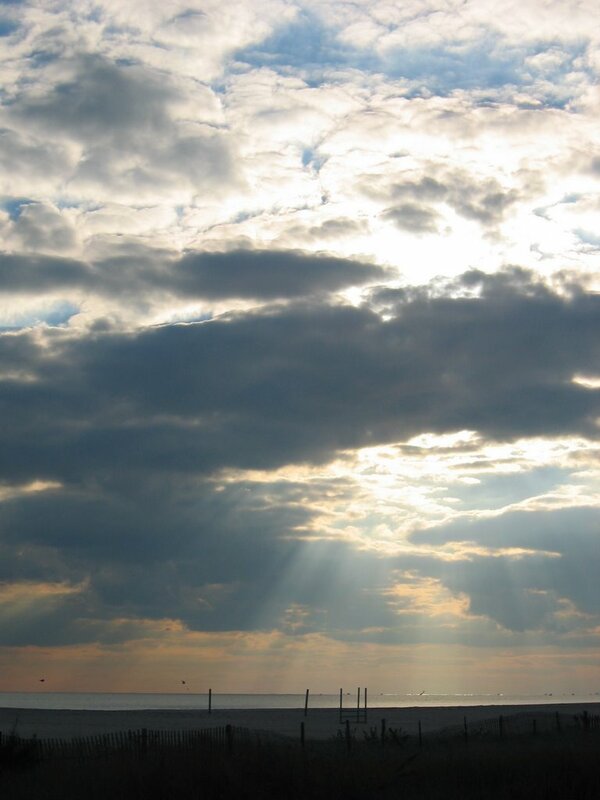 I can see the light! Woo hoo! The January/February 2006 issue marks the beginning of the magazine's 20th anniversary celebration and includes some great content, if I do say so myself. Thanks to my helpful and patient contributors and coworkers for facilitating the issue's completion. I can't wait to see and hear your reactions to the changes, additions and anniversary activities! I and The Bird deadline! Nov. 8: last opportunity to submit a contribution to I and The Bird #10. Send your permalink to Pamela now, eh. Researchers at Washington University School of Medicine in St. Louis recently published their discovery that male mice sing when they detect pheromones. Here's the synopsis and the entire article. The synopsis says, "Much of what we know about the biology of song and song learning comes from research on songbirds, but birds are difficult subjects for genetic studies. Song commonly figures in courtship rituals among birds, insects, and frogs, but such behavior in mammals had been restricted to whales, bats, and humans. Evidence of similar behavior in the mouse—a long-established genetic model, often referred to as the pocket human—could open whole new avenues of research into the genetic contributions to song and song learning." The online synopsis also provides a link to a recording of "mousesong." Further down, it says, "The males produced rapid “chirp-like” syllables of varying duration, spaced at about ten syllables per second, with a burst of closely spaced syllables followed by periods of silence. Some of the syllables showed sudden, significant changes in frequency (or pitch)—all in keeping with previous reports. To determine whether these frequency jumps, or pitch changes, followed a stereotyped pattern or occurred randomly, the authors first analyzed a set of 750 syllables produced by one mouse in a single 210-second trial. They identified discrete clusters of pitch changes, including two clusters with stereotyped jumps to or from a low frequency, which they called low jumps. Repeating the trial and analysis with 45 different mice produced similar results, indicating that the pitch changes are a universal feature of mouse ultrasonic vocalizations." 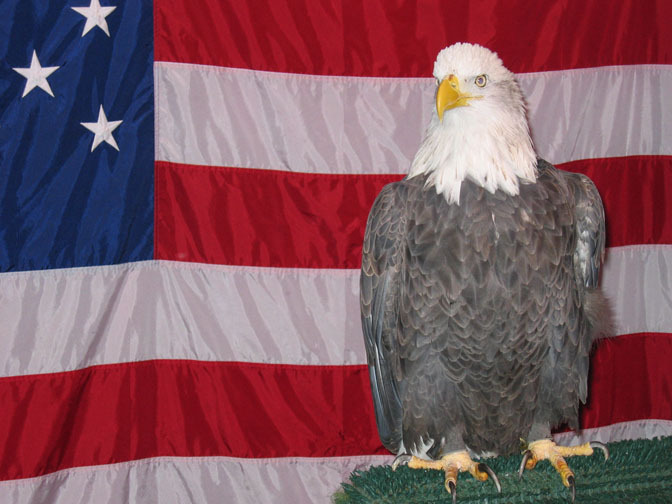 Did you hear about the Wildlife Action Plans submitted to the U.S. 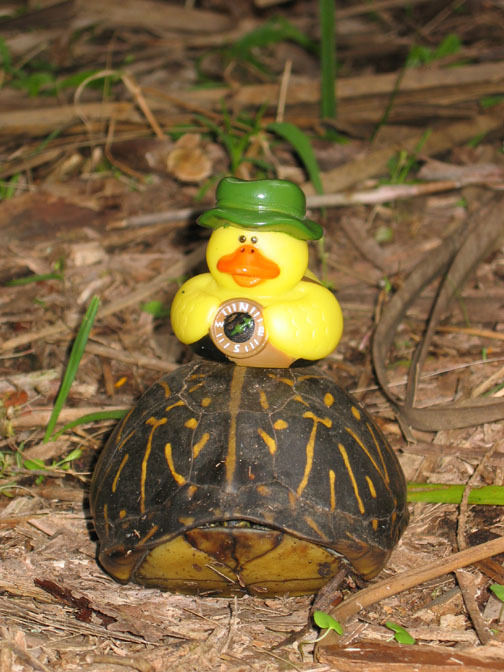 Fish and Wildlife Service by each state and the six U.S. territories? If the service approves each plan, it will have a national strategy for species conservation so that none become threatened or endangered. Each plan had to include details about low and declining populations of wildlife and the habitats that they need, pinpoint challenges affecting those populations, identify survey and research programs to improve conservation efforts, and choose priorities and actions. Interior Secretary Gail Norton said, "These plans represent a future for conservation in America that is rooted in cooperation and partnership between the federal government and states, tribes, local governments, conservation groups, private landowners and others with a commitment to the health of our land and water, fish and wildlife. "Working together, we are tapping into the expertise of those who live and work on the land so that we can conserve our fish and wildlife before they become threatened or endangered," she said. Eight U.S. FWS biologists and five state wildlife administrators are reviewing the plans and will share their recommendations to the FWS director. If approved, the plans allow states and territories to receive grants through the State Wildlife Grant program, signed into law in 2001. You can learn about your state plan by visiting Teaming with Wildlife. 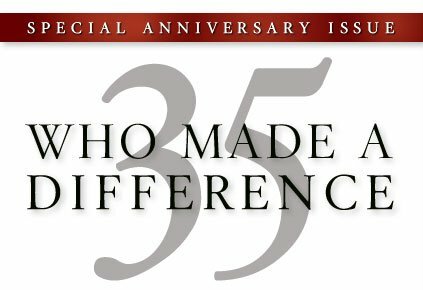 In its November issue, Smithsonian celebrated its 35th anniversary by honoring 35 scientists, artists and scholars. Within the list are Dan Janzen, a butterfly expert, and Mark Plotkin, an ethnobotanist working toward rainforest conservation. Their work might interest birders, which includes many butterfliers and conservationists within the group. You've likely seen or heard about avian flu in the newspaper or on television. It has killed humans in Asia and spread to Eastern Europe. North American ornithologists, however, said the H5N1 strain of the flu doesn't pose a threat to backyard birds or backyard birders. "There has not been a documented case of the H5N1 strain in wild birds in North America," said Dr. David Bonter of the Cornell Lab of Ornithology. "There is no need to be concerned about feeding birds." The species associated with the flu are ducks and other waterfowl. Rob Fergus of the National Audubon Society's science office said there's a difference between wild waterfowl and the species that visit backyard feeders. "At this point, thre is no evidence humans are at serious risk of contracting avian flu from backyard birds or birdfeeding." Humans infected with the flu were "closely associated with infected poultry," said Susan Hays, executive director of Wild Bird Feeding Industry.